We like to complain about human rights abuses in Communist China or North Korea. However, it is the United States with the highest incarceration rate in the world, and it is more than 6 times larger than Communist China. (The U.S jails 743 per 100,000 Americans; China jails just 122 per 100,000.) It seems that the United States is breeding criminals at a rate 6 times faster than China, and we have the highest incarceration rate in the world. Are we doing something wrong? I’ve been watching several documentaries on Netflix lately. Bloods and Crips said that 1 in 6 black men are jailed. No wonder there are so many single-parent households in the black community. But this isn’t just a black problem. When we put criminals in jail, many view it as a their university. The Hispanic gang MS-13 (known as World’s Most Dangerous Gang) actually doesn’t mind getting arrested, because when they are released, they know how to be better criminals. Being released from jail is a badge of honor, and these criminals gain even greater respect. In the documentary, the Clinton Administration thought it would be a good idea to release these prisoners back to their home countries. The result: mega criminals with increasing violence have turned MS-13 into an international crime ring. It’s not simply an American problem any more. We’ve exported MS-13 to Mexico and Central America now. So prison officials are trying a new tactic: solitary confinement. But in California, 4 prisoners in solitary still managed to organize a large-scale hunger strike to protest their mistreatment even though they are not supposed to communicate with anyone. Somehow, these masterminds find a way. There is even some research that long-term isolation makes prisoners not only more mentally ill, but more violent. European countries not only don’t jail as many people as the United States does, but don’t resort to solitary confinement because it seems to make the problem worse. When Joseph Smith ran for President, one of the things he advocated was rehabbing prisoners. Was he right? I’m fine with that for non-violent offenders. Yet some will complain that we should educate the law-abiding poor, rather than the prison population. I understand the sentiment, but many of the poor are the in jail because they turn to drugs or prostitution because they aren’t educated in the first place. Drugs are very lucrative, and if you’re bad a school, the choice of criminal activity is quite appealing. And if you are stuck in jail, rotting away, what are you going to do when you get out? You’re going to turn to crime. And it seems that there is some benefit to rehab. recidivism rates for released prisoners in the United States of America is 60% compared with 50% in the United Kingdom. The report attributed the lower recidivism rate in the UK to a focus on rehabilitation and education of prisoners compared with the US focus on punishment, deterrence and keeping potentially dangerous individuals away from society. White Supremecist Curtis Allgier serving a life sentence for killing corrections officer Stephen Anderson. Patrick Henry is famous for saying “Give me liberty, or give me death!” Is death a better option for violent gang members? In my mind, if someone organizes a hit from inside prison, this should be an automatic death penalty. In a recent case here in Utah, a white supremacist inmate faked a back injury, so he was escorted to the University of Utah for an MRI. He somehow managed to get the police officer’s gun and killed him. He was captured hours later. He pleaded guilty and has a life sentence. 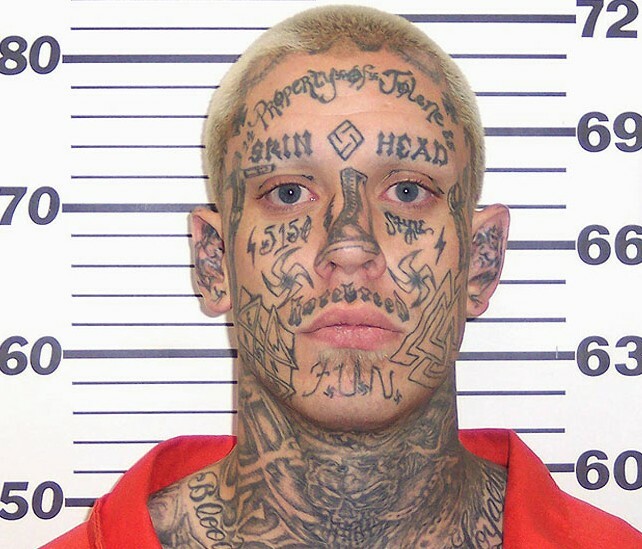 I think that such violent prisoners should be put to death quickly. I know that statistics show that blacks and men get executed at higher rates that women or other minorities, but in clear cut cases like this, I think this monster should not be allowed to breathe another breath. And I don’t want to keep spending money on more prisons. And exporting them to other countries so they can spread their violence (while well-intended at the time) is another bad idea. What are your thoughts? Was Joseph Smith right? What do we do with violent criminals? ← How Would You React if One of your Children Came Out to you? I think part of the problem is that we have such a large population of non-violent offenders being incarcerated right along side of the violent ones. The experience often teaches them to be violent criminals as well. While drug use is a pernicious and destructive thing, the so-called “war on drugs” has been needlessly violent and destructive in its own right. At very least, violent and non-violent offenders should not be in the same facilities. I believe that the educational effect that you have pointed out is compounded by our treatment of non-violent offenders as if they where murderers, rapists or thugs themselves. David, I think you are exactly right. The war on drugs is a big reason why the incarceration rate is so high. I know it appeals to some of our leaders’ sense of justice to jail them, but it is a high price to pay. These people need rehab, not jail. Save jail for the violent drug czars, not the users. Great article. We definitely need prison reform to keep non-violent offenders separated from the violent ones. I have personally seen a good outcome from a few people who were given drug treatment, instead of jail. Those who murder while in prison should be put to death quickly. What’s to stop a life sentence offender from murdering again? When you have a prison system that is run by private corporations then the more prisoners there are the money they are making. since they shut down the mental asylums the prison system has had to take up the slack.